Not all the paving work can be done with machines. With the deadline one day away, the paving crew on Albany’s Main Street project was working hard Thursday to finish the job by the time the city has promised. The street has been partially blocked since the spring. 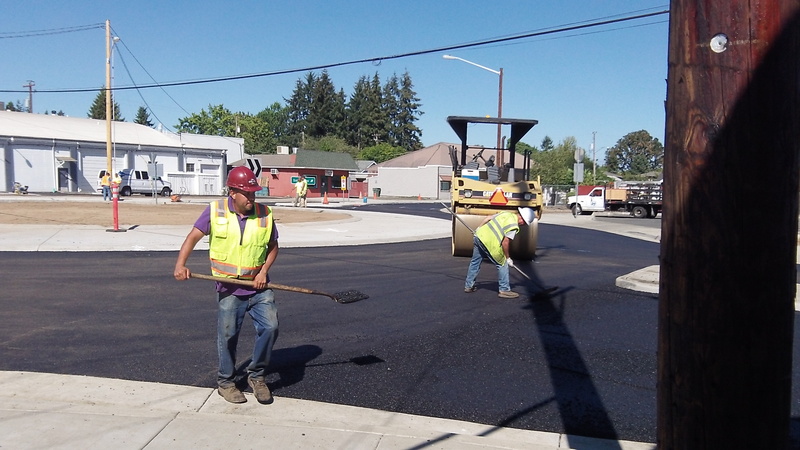 Last week, when it announced the temporary closure of that section of Main and nearby streets in order for the actual paving to be done, the public works department said the streets would be reopened to traffic by the end of the day Friday, Aug. 29. On Thursday afternoon it looked as though they might make it. 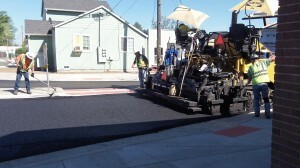 Most of the asphalt had been put down. Work on other parts of the project — landscaping and such– will continue for a while longer. The main element of the project is a roundabout connecting Main Street and Salem and Third Avenues. It’s intended to handle heavy traffic — an estimated 15,000 vehicles a day eventually — without the need for a congestion-causing signal. 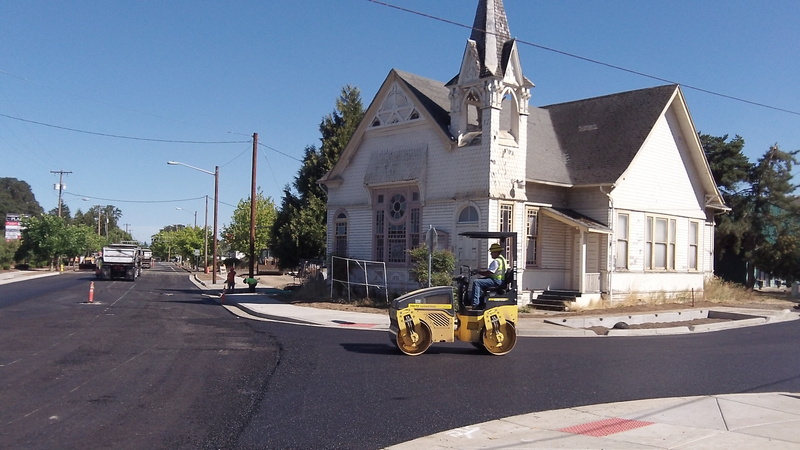 Mid-Valley Gravel Co. of Philomath has the $1.77 million contract for the project, which includes the street work as well as utility replacements. POSTSCRIPT: Heather Hill of Legacy Ballet and others report on Facebook today, Friday, that the paving project was completed and traffic started flowing again, just as the city promised. August 30 9:00 am – It’s open!!!!!!!!!!!!!!!!! Being one who was skeptical about how this roundabout would work after the way North Albany Rd/Gibson Hill was somewhat botched, I must admit this was well thought out and well done!!!! Kudos to all.